My name is Les Alfred, and I wear many different hats. 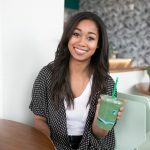 I’m a social media manager for a progressive women’s co-working space by day, and an online personal trainer and fitness coach by night, creating content and coaching clients through my business The Balanced Berry. In my business I help women build confidence and better body image through strength training, meal prep and self-care strategies. I have definitely not always been into fitness, and the outgoing personality seen on my blog and social media channels is a far cry from who I was in my teens and early 20s. After landing my first corporate internship the summer after my junior year of college, I noticed that sitting at a desk staring at a computer all day made me feel like absolute crap. I was exhausted all. the. time. And couldn’t figure out why I was so tired even though it felt like I wasn’t doing anything. I realized I didn’t want to feel that way for the next 40+ years of my career, so I started doing anything I could to give myself more energy, and quickly learned that I felt better by incorporating more movement into my life–and that was where my love of fitness began. At first, I started off slow by going to workout classes (and hiding in the back) and running because it was easily accessible and not as intimidating as the gym. While my energy levels started to improve, I began wanting more out of my wellness routine especially after I graduated from college. I learned more about nutrition and started cooking for myself. But more than anything, I wanted to feel strong, so I slowly started incorporating more strength training into my routine. The weight room was such a scary place (because I had no idea what I was doing), but I wanted so badly to learn. So I started going to the gym early in the morning before work, when it was empty. When I had the space to myself, I felt more comfortable learning new movements and techniques. I soon started researching and learning everything I could about strength training, and began feeling major changes physically and mentally. Along with discovering new muscles I never knew I had, I noticed myself becoming more confident. As someone who was always very quiet, reserved, and uncomfortable putting myself out there, I noticed I was gaining as much emotional strength as I was physical strength. I began feeling more comfortable putting myself out there, standing up for myself, and using my voice. And I knew if strength training could do that for me, then it could do that for other women too. So I decided to become a trainer and help others find the same strength I found. It’s been five years since I became a trainer and I haven’t looked back since! 6:00 a.m. – Alarm goes off. I’ll usually either snooze once or lay in bed for a few minutes and mentally gear up for the day. 6:15 a.m. – Make a big glass of lemon water and start brewing my morning coffee. 6:20 a.m. – Sip my lemon water while I journal. In the morning I like using my 5 Minute Journal to get me in a good head space for the day. I finish with a morning meditation using the Calm app, make my morning coffee, and head to the gym. Fast, efficient, and a quick sweat to get my day started! 7:45am – Came home from the gym, showered, and got dressed for work. Then made a smoothie and left for the office. 9:00am – Arrived at my office for my day job. I’m still new, so I spend a lot of time learning from my other team members. My work day typically consists of a lot of meetings and content creation for my company’s social media channels. 12 p.m. – During my lunch break, I try to go for a walk to get up and get my legs moving. I’ll also use this time to upload content to my social media channels if needed. 5:00 p.m. – My typical workday for my day job wraps up around 5 p.m. Thankfully, I don’t have a very long commute, so I’m not too drained by the time I get home. 5:30 p.m. – Once I get home, I like taking about an hour or two to decompress and relax before diving into work for my business. During this time I’ll usually change into comfy clothes, read, catch up on social media, make myself some dinner, and gear up for my second workday of the day. 6:30/7:00 p.m. – The work I do for my business varies by the day. A lot of my tasks revolve around programming workouts for clients, creating meal plans, and planning out new content for my blog, social media channels, and online workshops I host. 11:00pm – I try to wrap things up by 11 each night, but sometimes I do end up working later (but midnight is my hard stop unless I’m working on a tight deadline). I definitely don’t get as much sleep as I would like, but that’s part of having a side hustle. Usually, when I finish my second “work time,” I’ll go through my skincare routine. I love using oil-based products so I use Cocokind’s Cleansing Oil to remove all my makeup. Then I follow up with the Beautycounter Charcoal Cleansing bar to wash my face and any leftover oil or makeup that may be left. I then spritz on some rosewater to tone my skin, and finish off with a few drops of Argan oil on the dry areas of my face, and Egyptian Magic moisturizer around the eye area. I’ll be honest–my days are full and I don’t want to glamorize having a demanding schedule or packed sleep, and I don’t think a schedule like mine works for everyone. I am really fortunate to be able to have so many things I am able to do and enjoy, but I know a schedule like this isn’t sustainable for the long-term. I think I have a few more years of working like this in me before I’ll be ready for a slower pace. Next ArticleWhat Are Adaptogens And Can They Work For Me? Les is the Seattle-based personal trainer and fitness coach behind The Balanced Berry. She helps busy women build better body image and confidence through strength training and self-care. She loves sharing fun workouts, healthy recipes and real-life wellness tips. You can usually find her making new playlists, or getting lost in a book.